Nature gave the human ideal optical system. I assure you that no one could replace this system yet. Eyes - it is stretched brains, the whole complex ganglion. Not you control your vision, but brain. There laid the information and there determine what oculomotor muscles to work, to see distant objects? then relax the transverse(obliques) muscles and pull back eyes with longitudinal muscles. To see near objects? then relax the longitudinal muscles and pressure from above and below the eyes with transverse muscle. These working processes of the muscles do so quickly, that you do not notice how oculomotor muscles works.And when a human has an astigmatism, the oculomotor muscles are sick and do not relax, on the contrary, the myopic, transverse muscles are pressure on the eyes and farsighted, longitudinal muscles pull the eyes back. Due to excess of light when dark, ciliary muscle expands, increasing the pupil, when light ciliary muscle shrinking. Dark - it means not enough light to see, the brain tries to let in the eyes more information to see in the dark. Ciliary muscle expands. Light - it means sufficient quantity (flow of photons or electromagnetic waves), ie light, ciliary muscle shrinking. Through pupil light falls on the lens. 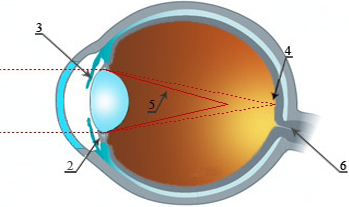 Ciliary muscle is not reduce and does not extend the lens (as suggested by Helmholtz), only doing his job over the surface of the lens. You are short-sighted - it means your focus № 4 falls on the optic nerve, the macula and you see everything in near. But the focus № 5 - it is image of distant objects, falls not on the optic nerve, because the transverse muscles of his astigmatism pressure on the eye above and below, and do not relax. If look in near point at any item after the half an hour it starts to develop astigmatism transverse(obliques) muscles, that means develop short-sightedness. In short, nearsightedness means sick transverse(obliques) muscles. Accommodation starts from the tips of the transverse (obliques) muscles, they are near the bottom of the ear cartilage. You are a far-sighted - so your focus № 5 falls on the optic nerve, the macula, and you see everything in the distance. But the focus № 4 goes into the back of your head - it is an image of close objects, falls not on the optic nerve, because the longitudinal muscles due to his astigmatism not relax, pull the eye back. If look at far point at any item after the half an hour it starts to develop astigmatism longitudinal muscles, that means develop long-sightedness. In short, farsightedness means sick longitudinal muscles. Accommodation starts from the tips of the longitudinal (recti) muscles, they are closer to the optic nerve. As you can see in myopic(nearsightedness), eyes elongated like a cucumber because muscles pressed the eyes. And far-sighted(hyperopia) eyes is flat, due to the fact that the muscles pull the eyes back. Here is Eureka, the whole technology. Brain due to oculomotor muscles makes accommodation. And the lens have always clear focus and never change. When all the oculomotor muscles relaxed, not pressured and did not pull the eye, the eye due to excess pressure itself becomes like a ball, acquires a symmetric form, and a person gets 100% sight, ie +1.